If you are a blogger, online marketer or marketing executive, you won’t survive without an email marketing strategy for a long time. 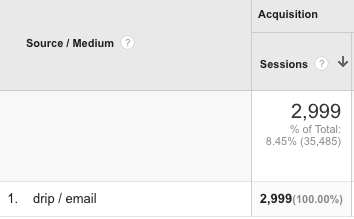 That’s how important email marketing is. The bad news is: When you are starting out, you probably don’t have an idea how email marketing works. All you know is that your inbox is full with newsletters that you aren’t very fond of (that’s putting it mildly) and that you probably can’t remember signing up for. Well, if you can’t remember signing up for a newsletter, and you don’t like getting the newsletter, that is a sign of bad email marketing. If you really didn’t sign up for the newsletter, or it is hard to get rid of it – then the newsletter is spam. That’s not what you should do when you start email marketing yourself – it would be a huge mistake. But many people refrain from email marketing themselves because they believe that this is what email marketing always looks like. That is an even bigger mistake. In this article I want to give you an overview of how good email marketing works and how you can start doing great email marketing yourself. We will start with a quick overview of the key elements of email marketing, proceed to examples of how to perform each step and then go through a list of recommended tools you can use for your email marketing! More web traffic: The most reliable form of web traffic is email traffic. Becoming a trusted source for information: A web visitor that doesn’t subscribe to your email address is highly unlikely ever to return. To get a visitor to return, you need to be able to stay in touch! Of course, the main goal still is to get your subscribers to perform actions with high ROI – but great email marketing has a lot of positive side effects! 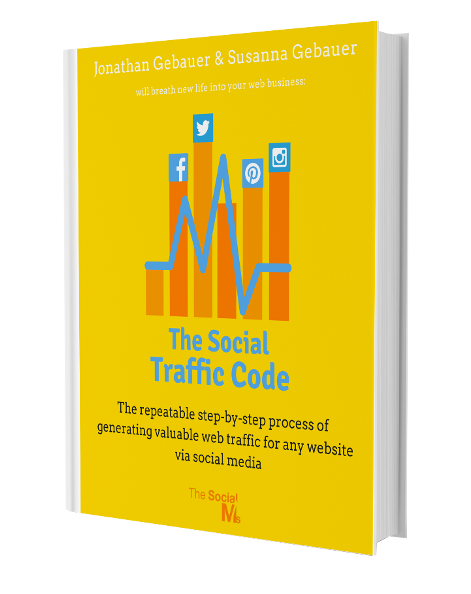 Learn to generate traffic to your website that you can turn into subscribers with “The Social Traffic Code” – includes a bonus chapter on email marketing! 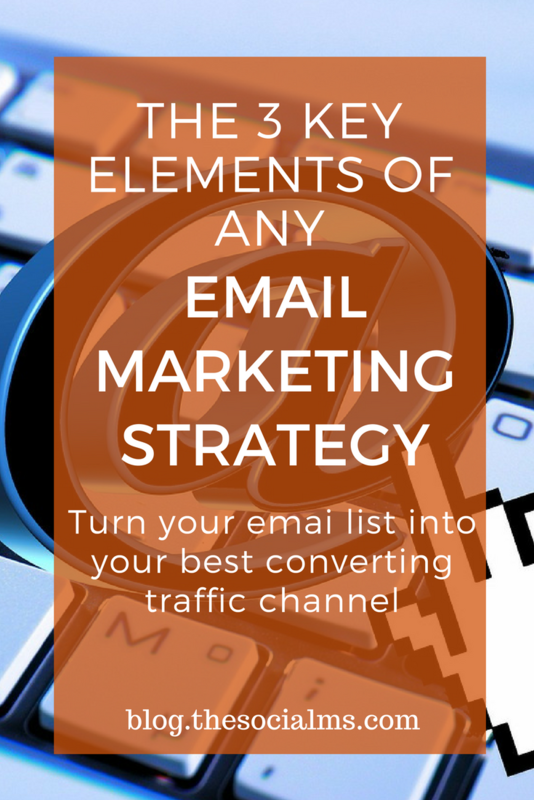 Let me give you a very short overview of a good email marketing strategy before we dive into the key elements in more detail. Every good email marketing process consists of 3 key elements: List building, list nurturing and reaping the benefits. List building means getting new email marketing subscribers. According to Hubspot and Marketing Sherpas, email lists decay by 2.1% each month – which means that they decay by 22.5 percent each year (Source: http://www.hubspot.com/database-decay)! 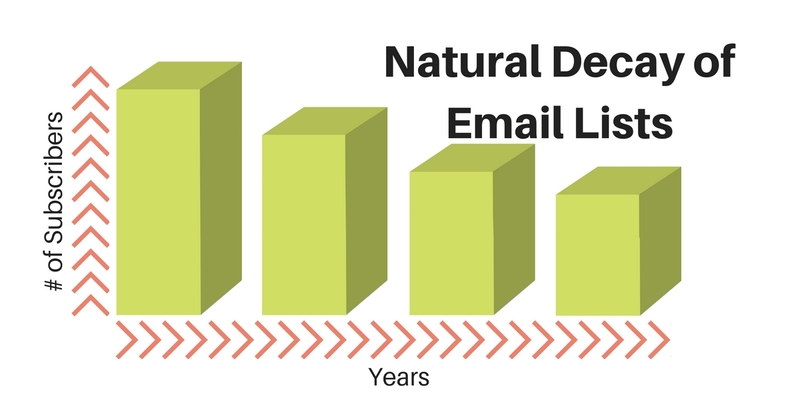 Even if your list is currently huge you will need to continuously add new subscribers to make up for natural list decay. List Nurturing is the process of consistently and repeatedly improving your relationship to each subscriber via emails. This is so important because in the end, it’s all about desired actions by the subscriber (see Reaping the Benefits below). A new subscriber may not be ready to take that action right after starting the subscription. In fact, most subscribers won’t be ready yet. You have to get them there – and you have to do this by building trust, building a relationship and creating a desire in the mind of the subscriber to perform the desired action. This process can take days, weeks or even month. Your interaction method is email – and you need to regularly send emails during that phase! Email marketing is all about desired actions by the subscriber. In the end, you want your subscriber to take actions that lead to a positive ROI for you! Of course, often you want to make a sale. But that’s not all that can lead to a positive ROI! Some companies just want their email subscribers to spread the word by sharing their products. Or they even want multiple actions: A sale and a review. Reaping the benefits is not just about selling – it is about figuring out the desired actions by subscribers to the best benefit of your business. Now that you have a basic understanding of these let’s dive in and examine how to perform each step of the journey! Ok, you know you need to build your list. But how do you do that? Below are some examples of relevant forms of getting newsletter subscribers. Newsletter subscribers are best generated on your websites – people consuming your content are likely interested in your topics and willing to sign up. But only having one newsletter subscription form without a real benefit for the future subscriber is probably not going to cut it! Below are a few examples of how you can generate new newsletter subscribers. 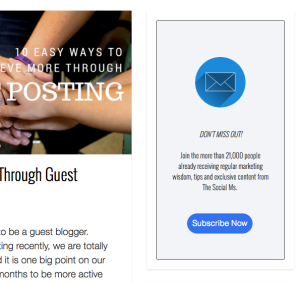 You are not limited to just one newsletter subscription form on your site! You can have quite a few of them – the key is to find the right mix for your audience! Clicking on the button opens a popup with a subscription form. 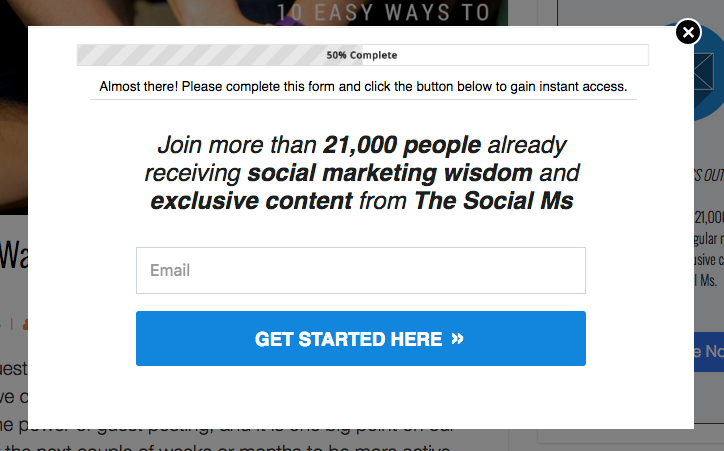 Here is the truth – this is not the most effective form of email list building. A few people will subscribe to this one, but not that many. But it’s a start. Note that we also made the above a little more efficient, because we not only say we send a regular newsletter, but also promise exclusive content that subscribers won’t get otherwise. We also deliver on that by sometimes sending out free content that you won’t get without being on our list! Also – for improved conversions, don’t just put a subscription form into your sidebar, use the 2-step process you’ve seen above (using the popup). So, if this isn’t the most effective way to generate subscribers, what else can you do? Popups and Page Takeovers are an important part of list building. If you now think that they are annoying, that may be true – yet, they just work too well to ignore them. Whenever using them, you should always use a reward in exchange for the email address. This reward can be a free document (a cheat sheet, free ebook, tutorial, …). Make tests with various forms of content and find out which works best for you. Also, have different freebies ready so that you can fulfill different needs and get more signups! Popups are the little windows/lightboxes that open above content while the user is reading it. The beauty of popups is that you can open them specifically when you want them to open. The ideal time for popups is often when the user is often when a visitor is already hooked to your content: He is reading an article on your site and suddenly, a popup opens in front of the content asking for his email address. He is sure to at least pay some attention to the popup because he was focusing his concentration on the content below it. This can be done by waiting some time before opening the popup (30 secs to a couple of minutes). Another useful popup is the popup that is triggered by exit intent of the visitor. This is the least intrusive popup you can use because it performs it’s action right before the visitor is about to leave your site! This may sound very intrusive to you – but the key is to offer a good reward in return for the email address. In our experience, the best way to use Page Takeovers is to show them right when a visitor visits your site. 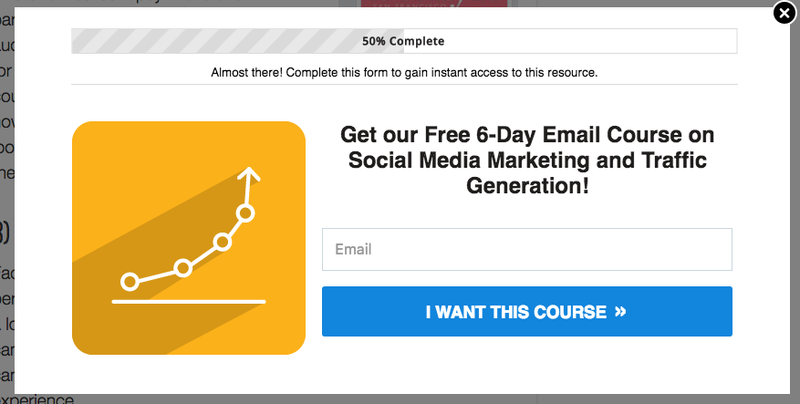 When you click on the link above, a popup will open – allowing you to download an ebook about email marketing in exchange for your email address. Content upgrades require you to build a library of free content so that you have enough free materials for a lot of your articles. The beauty is that these should be related to the content of the article – providing a user with even more content around his interests. They work like a charm. There are other ways of “baiting” users to subscribe to your email list – the above are the most common, though. Provide a PDF version of the content in return for an email address. Place a newsletter signup below articles. Collect email addresses by selling entry products for a very low price – like 99 cents. Probably every email address today get’s at least some newsletters that look annoying. That’s not what you should do! But the solution is NOT to not send newsletters at all or not send newsletters regularly. The solution is to send better newsletters. Newsletters that provide information that your subscribers are looking for. The idea is to build a value stream that shows new subscribers that you are valuable to them. When you do this right, your newsletters won’t even be perceived as newsletters! People will start answering these newsletters – thanking you for the great information you have provided them with for instance. When you provide your users with great information for a longer period, they will develop trust and a positive relationship with you! This is the beauty of modern marketing: You are building a value stream for your brand that connects it to your user. You are doing marketing that is so valuable that your subscribers would maybe even pay for it! But of course, you are not making them pay for it… yet. Blog posts are great information to send out via email. Of course, these should provide information that your subscribers want to have – but if you are creating these blog posts anyway – why not send them out as well? In the section above I told you that free content is a great way to get people to sign up for your newsletter. Well, guess what, sending out free stuff is also a great way to provide subscribers with value. If you already have quite a few freebies for new subscribers there is no harm in sometimes sending these out to your existing subscribers as well! You can even update the information once in a while and send updates. You can create a regular digest of great info you found on the web. Take information that was new to you and send it out to your subscribers as well – if it’s new to you, they can benefit as well! The above were just examples – ideas you can use. The key is to find your own ways to provide value to your subscribers. If you are unsure how you can provide value – you can always run a survey and ask them directly. This has the added benefit of letting them know that you really care about what they want! How to Reap the Benefits from your Activities! 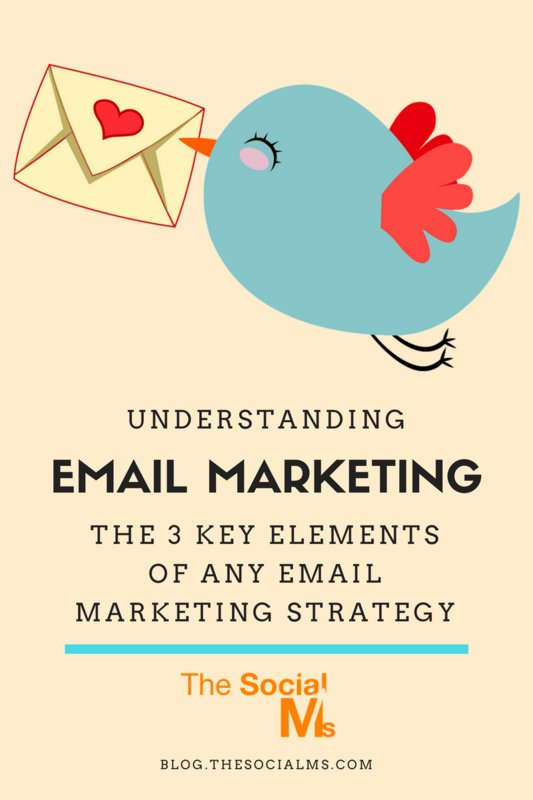 The 3rd key element of email marketing is reaping the benefits of your email marketing. That’s where email marketing becomes profitable! The key here is to have a clear goal at what you want your users to do. What will give you a positive ROI? Do you want to sell a product? Get your subscribers to a certain event? Get them to share your content on the social web? Something else? You can (and often should) have more than one goal. You may be selling more than one product. Or you may want to turn your subscribers into repeat customers buying form you over and over again. If you have built a lot of trust in the nurturing phase, it will become a lot easier to convince your subscribers to perform the action you want them to do. However, great lead nurturing is not a replacement for a compelling sales argument – your product still needs to provide solutions to the problems your audience has! List building, lead nurturing and reaping the benefits should never be seen as aspects standing each on its own. Treat them as family members of the same family! What I mean is, you shouldn’t create list building measures that do not relate to your list nurturing processes. If you sell ebooks about bike tours – your list building needs to focus on something related. For instance, you could give away one bike tour for free in return for an email address. In the end, with all the great information you have provided on the way, the final product you are trying to sell will seem like a logical progression of the journey until now. The first thing you will need for your email marketing process is an email tool or marketing automation software. There are many tools out there, that could be used, but there is a catch – many of these either only provide basic features and don’t feature advanced automation features once you need them. The tool that I recommend is called Drip. Drip is a relatively new email marketing and marketing automation tool – and it took me a while to arrive there. 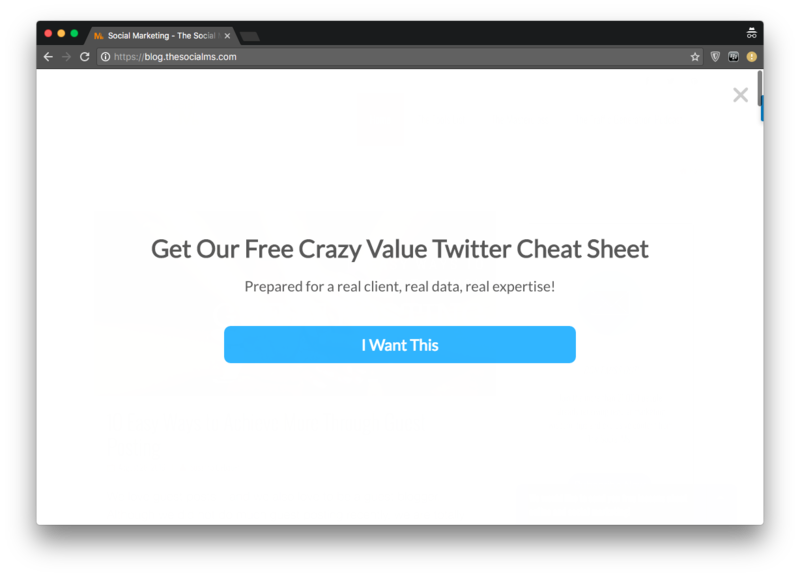 I tested probably every affordable email marketing tool out there (including Mailchimp, Zoho Campaigns, Convertkit and others). They all had big flaws that were too hard to overcome. Drip is different! It’s easy to use, easy to integrate into existing websites and it makes automation easy! 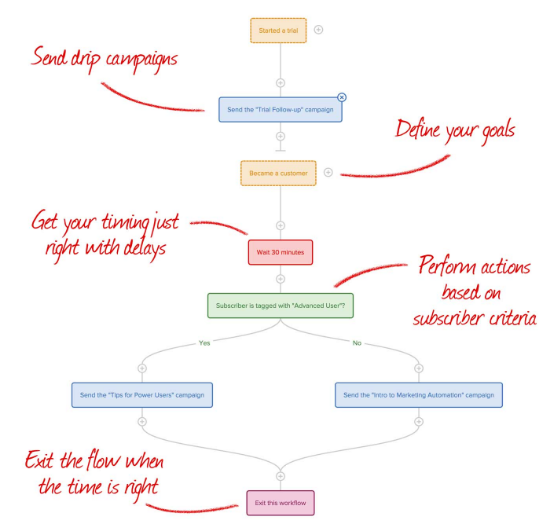 Using “Workflows” you can build complete automation sequences (complete with forking into different branches and actions based on subscriber interaction) within a graphical representation. This means you can come back to your workflows after a while and know exactly what is going on without breaking into sweat! No other email tool out there that I know of can compete for the price! If you are in the market for a newsletter tool I recommend trying out Drip! When you are starting from scratch you can try it almost for free – as Drip lets you get your first 100 subscribers for a single dollar! We use a combination of tools for all of these: Leadpages, HelloBar and SumoMe. Leadpages offers a great set of Landingpage templates, a complete landing page builder, Leadboxes, which are very helpful for content upgrades and popups and more. It’s not cheap, and you might be able to find a cheaper solution that works for you to start out, but later Leadpages may become mandatory. HelloBar and SumoMe provide various forms of Popups, Page Takeovers and list growth features. HelloBar can be used with a limited feature set for free, while SumoMe provides more advanced features when you are willing to pay for the premium. Like any modern marketing strategy, email marketing needs time to become effective. One of the main reasons it takes time is that it works by generating an audience – your list of email marketing subscribers. The bigger your list becomes, the more effective your email marketing strategy will become, and it takes time to build a large list. This is the same with any modern marketing method that relies on building an audience. It takes time to build one! This also means that you’ve been wasting time if you didn’t start your marketing activities until now! The later you start, the later you will be able to reap the benefits. Get the $1 version of Drip here. Implement some subscription forms on your site.